In the immediate aftermath of the battles of the 19th, the Massachusetts militia, under the loose leadership of William Heath, who was superseded by General Artemas Ward late on the 20th, formed a siege line extending from Chelsea, around the peninsulas of Boston and Charlestown, to Roxbury, effectively surrounding Boston on three sides. They particularly blocked the Charlestown Neck (the only land access to Charlestown), and the Boston Neck (the only land access to Boston, which was then a peninsula), leaving only the harbor and sea access under British control. 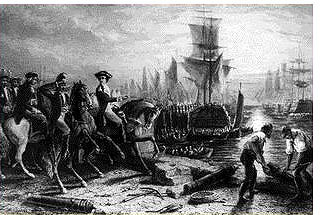 In the days immediately following, the size of the colonial forces grew, as militias from New Hampshire, Rhode Island, and Connecticut arrived on the scene. General Gage wrote of his surprise of the number of rebels surrounding the city: "The rebels are not the despicable rabble too many have supposed them to be....In all their wars against the French they never showed such conduct, attention, and perseverance as they do now." 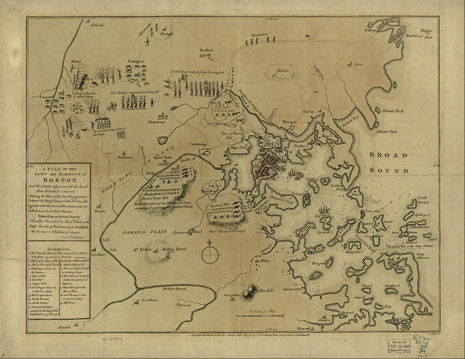 In the surrounded city of Boston, General Gage turned his attention to fortifying easily defensible positions. 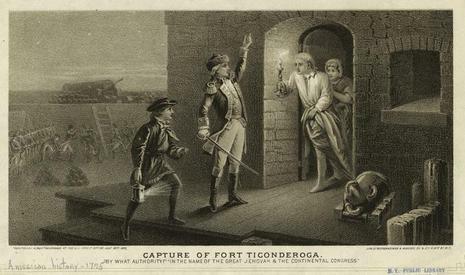 In the south, at Roxbury, Gage ordered lines of defenses with 10 twenty-four pound guns. On the peninsula of Boston itself, four hills were quickly fortified. They were to be the main defense of the city. Over time, each of these hills were strengthened Gage also decided to abandon Charlestown, removing the beleaguered forces (that had retreated from Concord) to Boston. The town of Charlestown itself was entirely vacant, and the high lands of Charlestown (Bunker Hill and Breed's Hill) were left undefended, as were the heights of Dorchester, which had a commanding view of the harbor and the city. 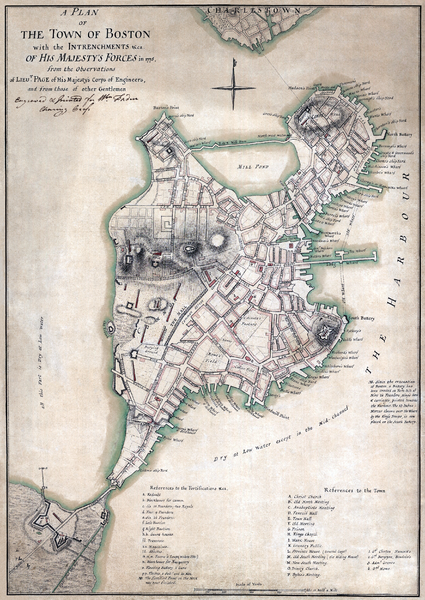 On the night of June 16th, about 1,200 men of the Colonial force besieging Boston moved on to the Charlestown isthmus overlooking the city and threw up entrenchments on Breed's Hill. The British garrison reacted promptly to this threat. On the 17th, 2,200 troops under Maj. Gen. William Howe were ferried across to the isthmus and stormed the American positions on Breed's Hill. 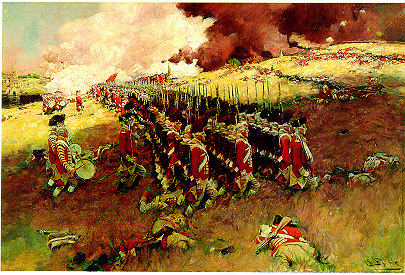 In the ensuing battle, incorrectly named after Bunker Hill which stands nearby, the British drove the Colonials from the isthmus after three assaults, but at a cost of about 1,000 in killed and wounded as compared with American losses of approximately 400 killed and wounded. Some 3,030 patriots took part in the fighting at one time or another. This proved to be the only major engagement of the prolonged siege of Boston. 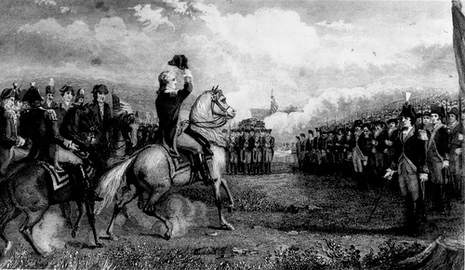 Gen. George Washington took formal command of the besieging army on July 3rd and devoted the next several months to building up the American force and trying to solve its severe logistical difficulties.